DJ Fontana has looked back on his glittering career at the drum stool. The former Elvis Presley sticksman reflected on his influences, touring and the death of the King. 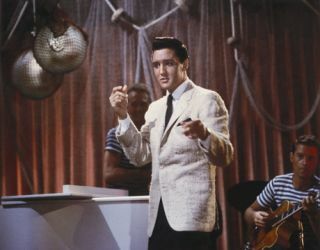 He told 2theadvocate.com that things weren't quite as glitzy as you may think when it came to hitting the road with Elvis. "You know, we worked hard. We just tried to cut good records. But we knew that if it wasn't for Elvis, we wouldn't have done anything. "We had one car. It was a Cadillac, not a big stretch job, as I recall, but it got us to where we had to go." Fontana, who during the interview notes the influence Woody Herman Band and Louie Bellson had on his playing, added that he struggled to believe that Elvis had died when the news broke on 16 August 1977. He recalled: "It was about 4 o'clock when a friend called us and said he'd heard Elvis died. I told him, 'Nah, you can't believe all that stuff. They've been trying to kill him off.' You just can't believe it when it happens."